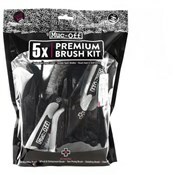 The Muc-Off 5 x Brush Set includes all Muc-Off's brushes, packaged together in a complete set. If you really want to give your bike a comprehensive clean, this set includes brushes for getting into all your bike's nooks and crannies, to leave every component spotless. To really get your bike clean, make sure you also by Muc-Off degreasers and bike cleaners to really get the best from your 5-brush set. With a sintered bristle compound, this is designed to clean your bike frame and components while caring for delicate finishes. The all-new design features a tough, impact-resistant handle that won't slip in extreme conditions, an oversized head for fast cleaning and rubberised impact zones for maximum protection. This is ideal for reaching hard-to-shift dirt on sprockets, hubs and other tight areas such as suspension mounts or fork crowns. The all-new design features a tough, impact-resistant handle that won't slip in extreme conditions, durable nylon bristles and rubberised impact zones for maximum protection on delicate finishes. Features high-quality construction with triple brush heads composed of tough nylon bristles and an integral scrapper for mud de-clogging. This brush is ideal for chain, cassette and sprockets, and it's even 10-speed compatible! This is shaped and contoured specifically to clean rims and spokes with ease. It's new design features a tough, impact-resistant handle that won't slip in extreme conditions, durable nylon bristles and rubberised impact zones for maximum protection on delicate finishes. This one is ideal for reaching hard-to-shift dirt on spokes, discs, shocks, cranks, linkages and pedals. 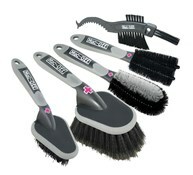 This new design features a tough, dual density handle that won't slip in extreme conditions and durable nylon bristles. The twin brush heads can be altered and repositioned to reach the tightest of areas. I decided, after weighing up the 3 set or the 5 set, to go with the whole bunch of brushes and, whilst I haven't used them all just yet, I'm pleased I did. The brushes are well put together and tough enough to tackle all the dried on mud I'd gathered. Well worth the money (which is fairly reasonable) and definitely beat the kitchen sponge I was using prior to purchase. Quality brush set for cleaning car and bike! This is my second set. Great value too. I have bought them before not at this price and will definitely be buying them again from Tredz at this price again. Great set perfect for my motorbike! Easy transaction delivered in a timely fashion. This is my second set of these brushesI use them on my car motorbike and cycles although they get well used on a weekly basis the set I bought about 3 years ago are still going strong but since they were on offer I decided to treat myself to a new set. I really wouldn't use anything else. 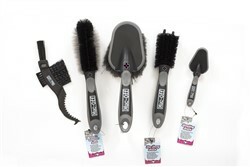 Excellent set of brushes and outstanding value for money! Recommended by a friend do a great job good price on this website. Fantastic quality brushes to clean each part of your bike. They importantly don't scratch the frame and it makes the laborious task of cleaning ones bike easier and dare I say it a little more fun. Brushes are well made and are ideal for cleaning all areas of my bike. Delivery was very quick. Highly recommended.